RVupgrades Blog: Top RV Accessories to Make Winter Camping Just a Little Bit Easier. Top RV Accessories to Make Winter Camping Just a Little Bit Easier. For most of the country Spring, Summer and Fall are the most ideal times to travel in your RV. But Winter can be a great time to hit the road and shake loose some of that cabin fever. If you and your family are up for some winter fun, you can get out and do some skiing and have your own chalet, or possibly take a snowmobiling adventure or just relax at a year round campground that you will most than likely have mostly to yourself. So if your located in the Northern half of the the U.S. and beginning to get a bit stir crazy, we have some great RV accessories that will make a trip out in the cold a bit easier. 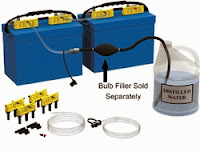 Battery Accessories - One of the most neglected items in an RV can be the batteries. They are generally tucked away, so they become out of sight and out of mind. When it's time to winterize, the battery watering system comes in real handy. Having to unscrew the caps off of maybe one or two batteries every month is easily doable, but add more batteries and maybe in a hard to reach location and you will be glad you had one. Easy to install and even easier to use, a battery watering system makes keeping your batteries in shape even in the winter a little easier. Those batteries also need to stay charged through the winter and giving them a little exercise wont hurt either. Just plugging your trailer or motorhome home in all winter may not be the best solution. Many RV's have converters that only have the ability to charge and if left plugged in long enough without use will ruin a battery in no time. The technology in today's battery chargers has come along way in recent years and using a charger, maintainer, desulfator will have your batteries ready to go even if you don't use your camper all winter. Companies like BatteryMinder and Noco have many different types of smart charges to keep any RV battery in perfect health even if your trailer is in a deep freeze..
Windshield Wipers - There is nothing more important than vehicle safety and for many weekend motorhome users windshield wipers are the last thing they think about until they need them. And when it comes to winter use those wipers better be in top condition or being able to see well while driving maybe near impossible. I have had some camping seasons where my wipers where never even turned on and in the following year I payed dearly for not replacing them even though they did not get any use. Furnace and Portable Heaters - When it's just too cold to remain outside, you will want that RV to be nice and warm when it's time to head inside. Generally, RV furnaces are pretty reliable, but if you feel the unit you have just cannot keep up with the cold, a new higher BTU maybe in order. 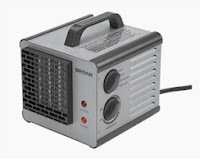 Another option can be adding a few portable heaters and there are none better than the super compact Broan Big Heat Portable Heater. This little heater pumps out some serious heat for it's size, but it also requires quite a bit of power to do so, using 12.5 amps on high. Even so we manage our power needs and never leave this great little heater home when we head out on those late and early winter trips. Doran Tire Pressure Monitoring System - Cold air can wreak havoc on your tire pressures. They can drop considerably and the way radial tires appear, it can be very hard to tell visually that your tires are under inflated. In order to remain safe during winter travel, you must check your tire pressures regularly and a Doran 360 RV system makes that job very easy. It monitors your tires at all times and warns you the second you have an issues. I don't leave home with out this amazing RV accessory no matter what the season maybe. Well that's a few of the items you can use to make a winter RV outing a little more enjoyable and safe. Obviously taking care of your plumbing system so it doesn't freeze is vital as well and something to keep in mind depending on what type of cold you are RV'ing in. To outfit your RV for winter travel and camping adventures, visit RVupgrades.com. RVupgrades.com has everything you need to repair and customize your RV from roof repair products to hitch accessories. All of the above products are available on our website, we are also available through chat, our Q & A system and phone if you have any questions about which accessories will work best with your set up.